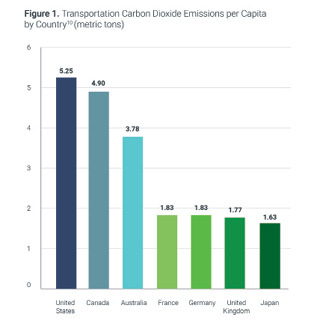 Eliminating carbon emissions from the American transportation system can be done, according to a new report from the Frontier Group [PDF]. The tools to reduce energy use from cars and light trucks at least 90 percent are at our disposal or in advanced stages of development. The remaining 10 percent could be supplied by renewables like wind power. “We have the technical capacity to do all of these things,” Frontier’s Tony Dutzik told Streetsblog. Here’s how it would work, if we can muster the will. The first step is to reduce driving. Frontier Group estimates that the following four strategies could cut miles driven per capita by 28 to 42 percent, which amounts to a 10 percent total decline by 2050 when accounting for population growth. 1. Walkable Development: We have to build more walkable places where people don’t have to hop in a car for every trip. People living in compact neighborhoods drive 20 to 40 percent less than people living in spread out areas. If 60 to 90 percent of new construction between now and 2050 is walkable development with good transit connections, it could reduce total GHG emissions from transportation 9 to 15 percent. To accomplish that, Frontier says big coastal cities like New York and San Francisco need to “build up” and make room for more people. Meanwhile, sprawling places like Atlanta and Houston need to seize opportunities to redevelop existing space — parking lots or closed malls, for example — in a compact form. 2. Pricing Roads: Pricing parking alone could reduce total vehicle miles traveled by up to 3 percent. A blanket vehicle miles traveled tax, meanwhile, could reduce mileage by 10 to 12 percent. Congestion pricing, which puts a higher price on road use where and when traffic is most intense, is another avenue to cut mileage. London’s congestion pricing system, which only covers the central city, has helped reduce driving 10 percent even as the population has grown, Frontier reports. 3. Safe Routes for Walking and Biking: Shifting trips to bicycling can reduce GHG emissions by as much as 11 percent by 2050, according to the Institute for Transportation and Development Policy. In order to promote such a big change in behavior we have to reallocate street space for transit, walking and biking. Providing safe routes is the key to getting more people to bike, says Frontier reports. 4. Better Transit: Investing in reliable, convenient transit service will not only shift travel to a more efficient mode, it also feeds into a “virtuous cycle” of more walkable development and less car dependence. 5. Electric Vehicles: Replacing internal combustion engines with battery-powered electric cars could yield big emissions reductions. Electric cars can of course be powered with renewable energy, and unlike internal combustion engines, they don’t lose most of the energy they produce to heat and friction. The Natural Resources Defense Council estimates that if just over half of the vehicles on the road in 2050 are electric, GHG emissions from transportation would be reduced 52 to 60 percent. 7. Sharing Car Trips: Households that switch from driving their own cars to ride-hailing and other shared-mobility options could reduce their transportation GHG emissions 51 percent, according to research published last year by T. Donna Chen and Kara M. Kockelman. A 2015 study by Peter Viechinicki estimated that as many of 19 million Americans would switch from private cars to ride-hailing if barriers were eliminated. Can you imagine being jammed into high rises in a congested city no gardens no privacy it will not work in America. Electric cars still need to plug them in the grid would not be able to handle the increase in electricity. When life is no longer worth living why bother. New York, Chicago, etc. are not in America? Then what country are they in? What does this have to do with the things mentioned in the article? The only thing that even vaguely resembles being “jammed into high rises” is the walkable development, and that can probably be done with gardens and privacy if so much space is not used for car infrastructure. And no one will be forced into it. Anyone who doesn’t like it can find plenty of relatively cheap suburban houses to live in. Is this really going to make life “no longer worth living”, any more than the alternative of driving and producing lots of greenhouse gases? Legalizing corner stores in suburbs would actually be a huge step in making this happening. It’s bizarre that commerce is banned is such huge areas in America. I mean, you can buy a motorcycle, can-am, or cargo bike right now (just gas powered), for pretty cheap. And yet, people buy far more expensive cars, for reasons ranging from safety, to comfort, to weather protection. Would having electric versions of these vehicles change that calculus? I doubt it. People will still mostly want the safety and convenience of a car (electric or otherwise). removing all subsidies for mass motoring would reduce VMT by 1/2. One of my SoCal boomer school buddies just empty nested from a 2,100 sqft house 1/2 mile from the beach in a 80% walkable 1940s beach town to a 3,500 sqft house in a 1990s ‘community’ where the nearest store is a Five Mile Drive away. Amen. I’m not quite boomer (mid 40s) but I’m the only one among my friends that doesn’t drive. I have had no luck converting any of them but I have had luck with two millenials at work, one of which is selling her car at the end of June. Boomers and even Gen Xers are too saddled with fear, apathy and sloth to be converted but there is definitely hope and a paradigm shift is happening, in spite of hostile, privileged and entitled resistance from our depressingly fearful generations. Probably stating the obvious… but the “safe routes for biking and walking” must be a) reasonably direct; and b) connect the places where people want to get. I love high rises – I’ve never had the luxury of living in one, but when I stay in high rise hotels, the views you get can be amazing. You should try it sometime. 50-80% of Harleys out there have had the mufflers and catalytic converters removed my their owners. Dropping the hammer on these owners and the exhaust manufacturers would go a long way to ending the polluting culture. Whatever the EPA regulates the OEMs to do is being undone by owners.